Aggies Do It Better: My Final Cake from Class! 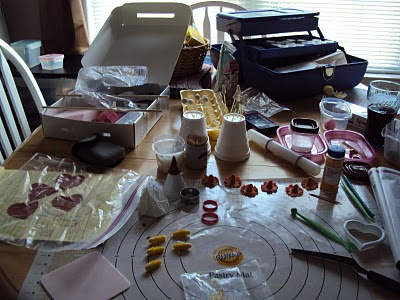 So....this is what my kitchen table has looked like for the past week. Except when I have to clean up to feed the goofballs. 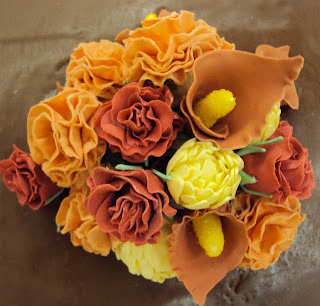 I've been making the flowers that were going on the cake, a few at a time. Which is kind of annoying, considering all the stuff you have to get out to make them. Would I have liked to be able to make them all at once? YES. Will my boys allow that? NOOOOOOOOOOOOOOOOO. But anyway, I got pretty much all of them done in not exactly the colors I wanted, and they wound up being pretty fall-ish. 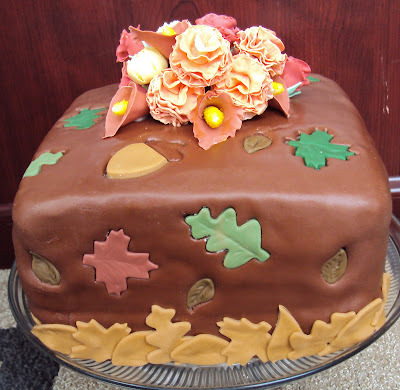 I was pretty busy Sunday morning making this chocolate-marshmallow fondant. 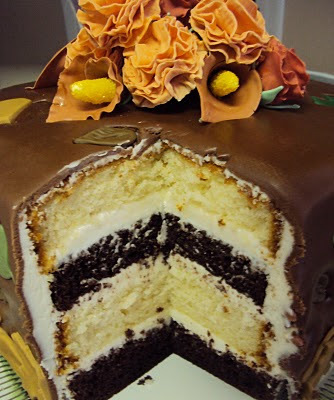 I'd never made it before, but I wanted to bring in something I'd be working with (like the regular marshmallow fondant. That's what I usually use instead of the boxed kind because it tastes so much better) and could practice with. Oh, and also? This was the first square cake I've ever baked also in my brand-new square pans. 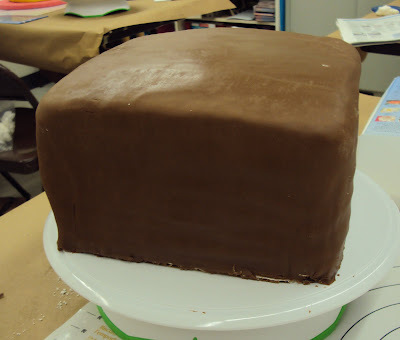 My wedding cake was square, that's how much I love square cakes. I'd also, obviously, never covered a square cake with fondant, and I've heard they can be kind of squirrely, so another chance to practice! I also whipped up a batch of fresh buttercream to ice my cake. It was kind of a, well, you know, to roll out. It was pretty soft and sticky. And I even added more powdered sugar than the recipe called for! But I managed to get it on the cake in one piece....sooo....SUCCESS!!!! p.s. This fondant smells and tastes like Tootsie Roll...mmmmm.....so insanely good. I had a lot extra so I shared with the class :) The general consensus was....YUM. Next I put all my flowers together. I thought I got a picture of the 2 egg cartons I carried them in in, but I guess I didn't. I had so much crap to carry in I actually had to get a grocery cart. Yall should have seen me. DORK ALERT! I meant to get a picture of that too, but, oh well. It took me forever to get them to stay where I wanted. I think I mentioned before that I am not a flower person so I had no idea how to arrange them. All I know is, I'm a fan of tightly bunched bouquets. Next I started to combine colors for my leaves. 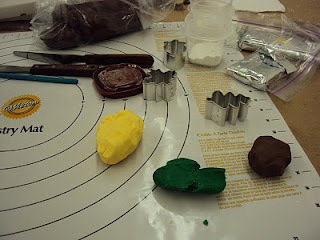 I had hunks of green, yellow, light brown, dark brown, and dark red. I just kept putting colors together until I got what I was looking for. 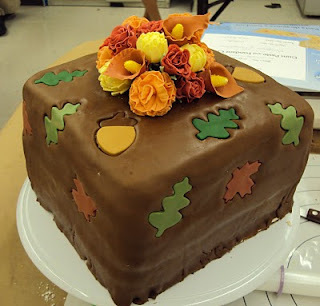 Then after I rolled out and cut out a few of each leaf shape in the colors, I cut a piece out of the fondant already on the cake and picked it out. (Hello? Time Consuming.) Then I put the colored one in there. The idea I was going for was green leaves changing colors and falling down. That's about as far as I got after my 2 hours were up. I had to pack up all my stuff and lug it home to finish. And in case you were wondering....here's the inside. I almost cried when I had to cut it. 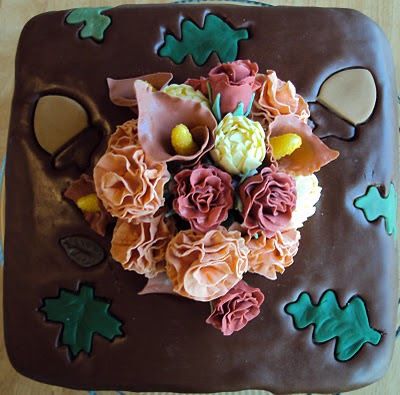 Usually I make the fancy cakes for other people so I don't have to do it!! Been giving out samples at work getting you some more business. Really good honey. That seriously looks amazing! I don't know how you do it. My baking skills are so under par for sure. If we ever live in the same area I will hire you to make all my special event cakes!! Great job. Looks like you learned a lot in your class. Keep it up.